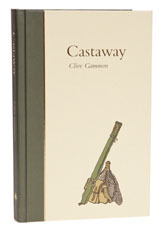 Clive Gammon was Creel’s sea fishing columnist and was the only person whose writing appears in all 47 issues of the magazine; by 1962, the year in which Creel first appeared, he had already published three books and was well-known to Bernard Venables, who had fished with Clive while he was working for the Angling Times. With this background, it isn't surprising that Clive did so well that he began a move into mainstream journalism for the Express and the Sunday Times, but this was cut short by a transfer to America, where he stayed for nearly twenty five years, writing for Sports Illustrated. In the mid eighties Clive retired and came back to Wales. Clive is an effortlessly good writer, so and any new collection of stories from his pen is welcome. Starting with pike fishing on Boxing Day, Castaway bounds further and further afield with every chapter, chasing pollack in Dingle Bay, tuna in Zululand, sea trout in Norway, garfish in Egypt, tarpon in Florida – you name it, Clive goes there and catches it. It is all great stuff and immensely enjoyable, my only regret being that the book isn’t twice the length.